Thomas Cole (February 1, 1801 - February 11, 1848) was a nineteenth century American artist whose works initiated the first indigenous art movement in the U.S. He is regarded as the "Founding Father" of the Hudson River School, an American art movement that flourished in the mid-nineteenth century and was concerned with the realistic portrayal of nature. His romanticized depiction of nature inspired not only artists of his time, but those that followed, to depict the inspiration and beauty of nature, often in a fantastic or allegorical fashion. His historical and allegorical paintings of the 1820s and 1830s gave way to the religious allegories that dominated the last decade of his life and still exhibited his genius for landscapes. He worked religious emblems into his works and exhibited the paintings with a text that identified and explained each symbol. 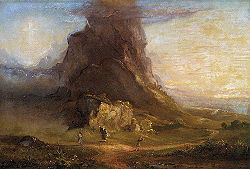 Thomas Cole was born in Bolton, Lancashire, England. In 1818, his family emigrated to the United States, settling in Steubenville, Ohio, where Cole, who had studied engraving briefly in England, taught art in his sister's school. He learned the rudiments of painting from a wandering portrait painter named Stein, but was mostly self taught. However, he had little success painting portraits, and his interest shifted to landscape painting. Cole moved to Pittsburgh, Pennsylvania, in 1823, and then to Philadelphia in 1824, where he drew from casts at the Pennsylvania Academy of the Fine Arts and exhibited for the first time. The following year, Cole rejoined his parents and sister in New York City. In New York City, Cole sold three paintings to George W. Bruen, who financed a summer trip to the Hudson Valley, where he visited the Catskill Mountain House and painted the ruins of Fort Putnam. Returning to New York, he displayed three landscapes in the window of a bookstore, where, as recounted in the pages of the New York Evening Post, they attracted the attention of the painter and president of the American Academy of Fine Arts John Trumbull, who bought one of his canvases, sought him out, and put him into contact with a number of his artist and aristocratic friends including Robert Gilmore of Baltimore and Daniel Wadsworth of Hartford, who became important patrons of the artist, as well as the painters Asher B. Durandand William Dunlap. In 1826, he moved to Catskill, New York, where he maintained a studio at the farm called Cedar Grove. He painted a significant portion of his work in this studio, inspired by the pastoral beauty of the White Mountains and Niagra Falls. By 1829, when he decided to go to Europe to study firsthand the great works of the past, he had become one of the founding members of the National Academy of Design and was generally recognized as America's leading landscape painter. Cole spent the years 1829 to 1832 in England and Italy supported by his patron Robert Gilmore. At one point he lived with sculptor Horatio Greenough in Florence. During this time he began to express in his painting the elevated moral tone and concern with lofty themes previously the province of history painting. He then returned to New York, in 1832, where the New York merchant Luman Reed, commissioned him to paint The Course of Empire (1836), a five-canvas extravaganza depicting the progress of a society from the savage state to the heights of luxury and, finally, to dissolution and extinction. In 1836, he married Maria Bartow of Catskill, whose family home became their permanent residence. In March 1839, following the success of The Course of Empire, Cole received his next important commission: The Voyage of Life for Samuel Ward (1786-1839) (father of Julia Ward Howe) who, like Cole's patron, Luman Reed (1787-1836), had a gallery of paintings in his house in New York City. While The Course of Empire represented the emergence of Cole as a mature artist, The Voyage of Life was the creative enterprise that dominated his later career. These were said to be considerably influenced by J.M.W. Turner's Building of Carthage, which Cole had seen while in London. Cole went to Europe again in 1841, returned home, and visited Mount Desert on the coast, Maine, and Niagra. He died, aged 47, in Catskill, New York, on February 11, 1848. His home, Cedar Grove, located in Catskill, is a National Historic Site affiliated with the National Park Service. After his return from Europe, Cole made the decision to receive baptism, confirmation, and communion in the Episcopal Church and became a member of Saint Luke's Episcopal Church in Catskill. Cole later designed a new church building for Saint Luke's and for his friend and eventual biographer, The Reverend Louis L. Noble, the Church Rector. The present Saint Luke's Church is situated on William Street where a stained glass window honors the Cole Family. The contemplation of his works made men better. It is said of one of the old Italian painters, that he never began a painting without first offering a prayer. The paintings of Cole are of that nature that it hardly transcends the proper use of language to call them acts of religion. Yet do they never strike us as strained or forced in character; they teach but what rose spontaneously in the mind of the artist; they were the sincere communications of his own moral and intellectual being. Cole was primarily a painter of landscapes, but he also painted allegorical works. The most famous of these are the five-part series, The Course of Empire, which he painted in the winter of 1835-1836, in Catskill. At the time, Cole had strong concerns for the negative impact of industrial development on nature and the Catskill landscape became a major source of his artistic inspiration. The local growth of railroads was said to be particularly disconcerting to him. Another of Cole's allegorical works includes the four-part The Voyage of Life, which he painted two versions of; one which resides at the National Gallery in Washington, D.C., and the other at the Munson-Williams-Proctor Arts Institute in Utica, New York. The four pictures in The Voyage of Life—Childhood, Youth, Manhood, and Old Age—offered a simple allegorical message about the pilgrim's journey through life, concluding with the promise of eternal salvation. The second painting of the series shows a young man being sent off down river in a boat by a beckoning angel. The youth, with raised hand, full of promise, looks towards an almost translucent and ethereal palace in the sky. It remains one of of Cole's most popular works. Nearing the time of his death, he was painting the religious allegory, Cross of the World. His final work was meant to be another series of five paintings. At his premature death, he had completed all five studies but only two of the actual paintings. The idea to be conveyed was of two youths setting out on a pilgrimage through a chain of mountains with craggy peaks, with one youth taking the path of the cross and the other the path of the world. The Hudson River School was a group of artists influenced by romanticism who painted the landscapes of the Hudson River Valley, the Catskill Mountains, the Adirondack Mountains, and the New Hampshire White Mountains. Thomas Cole is called the founder of this school, having made one of the first landscape paintings of the eastern Catskill Mountains, in 1825. Artistic peers of Cole which he influenced include Asher B. Durand and Frederic Edwin Church, who studied with him from 1844-1846. The Hudson River School also included well known painter Albert Bierstadt and a second generation of painters that were several in number. The Hudson River Art School's thematic scenes of nineteenth century America bolstered movements to create city parks, protect national parks, and to move west into the vast wilderness of the country. Their works are still valued today for their glorification of nature and their messages of discovery, exploration, and the settlement of America. Cole dabbled in architecture, a not uncommon practice at the time when the profession was not so codified. Cole was an entrant in the design competition held in 1838, to create a new state government building in Columbus, Ohio. His entry won third place, and many contend that the finished building, a composite of the first, second, and third place entries, bears a great similarity to Cole's entry. 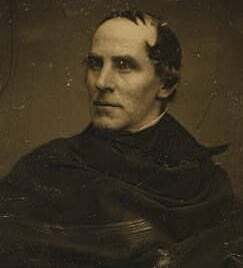 In addition, Cole made designs for a new building for Saint Luke's Episcopal Church, in Catskill, New York, where he received baptism and became a member in 1842. A stained glass window honors the Cole family in the present building. Cole consistently recorded his thoughts in a formidable body of writing: Detailed journals, many poems, and an influential essay on American scenery. Further, he encouraged and fostered the careers of Asher B. Durand and Frederic E. Church, two artists who would continue the painting tradition he had established. The second generation of Hudson River School artists emerged to prominence after Cole's premature death in 1848, including Cole's understudy, Frederic Edwin Church, John Frederick Kensett, and Sanford Robinson Gifford and Alfred Bierstadt. Works by artists of this second generation are often described as examples of Luminism, or the Luminist movement in American art. In addition to pursuing their art, many of the artists, including Kensett, Gifford, and Church, were founders of the Metropolitan Museum of Art in New York City. One of the largest collections of paintings by artists of the Hudson River School is at the Wadsworth Atheneum in Hartford, Connecticut. Some of the most notable works in the Atheneum's collection are thirteen landscapes by Thomas Cole, and eleven by Hartford native Frederic E. Church, both of whom were personal friends of the museum's founder, Daniel Wadsworth. 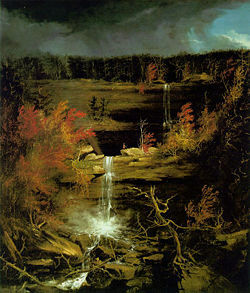 Other important collections of Hudson River School art can be seen at the Metropolitan Museum of Art and the New-York Historical Society, both in New York City; the Brooklyn Museum in Brooklyn, New York; the National Gallery of Art in Washington, D.C.; the Gilcrease Museum in Tulsa, Oklahoma; and the Westervelt Warner Museum of American Art in Tuscaloosa, Alabama. The fourth highest peak in the Catskills bears his name. ↑ Home.att.net, The Hudson River School. Retrieved December 20, 2007. ↑ Hamilton Auction Galleries, View of Fort Putnam. Retrieved December 20, 2007. ↑ Hamilton Auction Galleries, the Dawn of the Hudson River School. Retrieved December 20, 2007. ↑ Artchive, Thomas Cole. Retrieved December 20, 2007. ↑ Biography Resource Center, Thomas Cole. Retrieved December 12, 2007. ↑ Earl A. Powell, III, Thomas Cole's Voyage of Life in the National Gallery of Art. Retrieved December 20, 2007. ↑ Thomas Cole Homepage, Thomas Cole biography. Retrieved December 20, 2007. ↑ The Thomas Cole National Historic Site, Biography of Thomas Cole. Retrieved December 17, 2007. ↑ Google Books, Epic Paintings of Thomas Cole. Retrieved December 20, 2007. ↑ The Thomas Cold National Historic Site, Biography of Thomas Cole. Retrieved Dec. 17, 2007. "Thomas Cole." 1998. In Encyclopedia of World Biography, 2nd ed. 17 Vols. Gale Research. All links retrieved June 4, 2013. Cedar Grove - The Thomas Cole National Historical Site Thomascole.org. Coles' White Mountain paintings Whitemountainart.com. 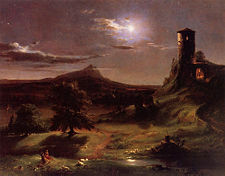 Thomas Cole's "Voyage of Life" Now Placed in St. Luke's Hospital Query.nytimes.com. On the Life of Thomas Cole Catskillarchive.com. Schweizer, Dr. Paul D. 1985. The Voyage of Life: A Chronology Tfaoi.com. Cotter, Holland. 1995. A Volatile Master Who Made Nature's Splendor His Religion Query.nytimes.com. This page was last modified on 4 June 2013, at 14:09.